I have been asked before what my most memorable sighting might have been, but that is something difficult for me to choose. I cannot pick one, from the many amazing natural events I have been fortunate to witness. However, one particular game drive from Chitabe camp, in the Okavango Delta, springs instantly to mind as maybe one of my best ever. 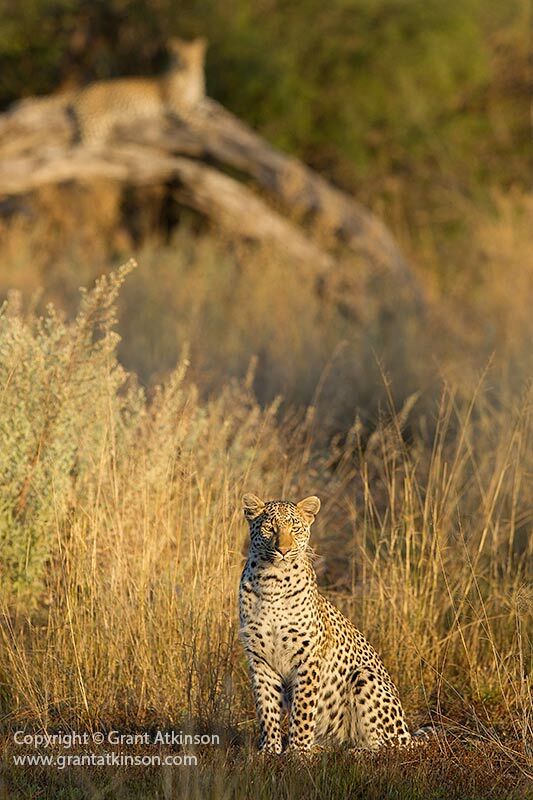 As the sun rose, our guide Finley, found a young leopard. Working with some of the most skilled local guides as they track these animals is part of the excitement. Having a subject at sunrise is great for photography. For a few minutes, the light is so gentle, and so warm, that almost any angle is rewarding. The leopard had a sister nearby, and the two cats were looking toward the sun. One cat was on the ground, and the other had climbed a fallen stump behind. As we were photographing them, we realized that they were paying unwavering attention to something behind us. A glance in the direction revealed the reason for the cat’s curiousity. Wild dogs! Just a few hundred metres away. When we reached the dogs, they were in tall grass, boldly patterned heads and shoulders showing. With 21 adults, and 6 mobile pups, the pack alone was in itself a very special sighting. With such a big pack, they had a lot to get done. They needed at least two, maybe more, impala a day to keep them going. The pups needed guarding. We could see from a little blood on their faces, that some dogs had fed just minutes before. When a spotted hyaena walked into the scene, a group of dogs just tore after it. The hyaena took refuge in a bush, and then retreated. 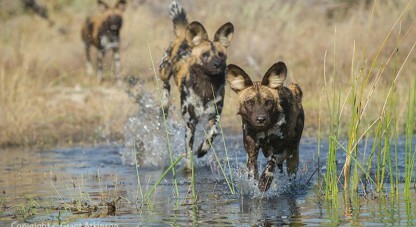 At the same time, a herd of elephants nearby became angered by the commotion, and decided to charge at some of the dogs. Dust swirled, elephants trumpeted, but it was too chaotic and fast-moving for us to photograph. 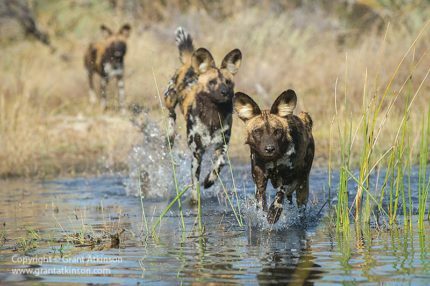 Moments later, with the hyaena and elephants out of the scene, the dog pack regrouped and began to move towards a short grass area right alongside a shallow channel, and in the direction of the two leopards. When the dogs reached the water’s edge, the pups took to play with one another, and several of the adults lay down nearby. They had barely settled when a sharp-eyed dog noticed one of the leopards, and a detachment of dogs immediately set off toward the the cats. In the distance we saw both leopards quickly slip away into the vegetation. At that point, some of the dogs decided that they wanted to cool off after their exertions,, and they took to the water. 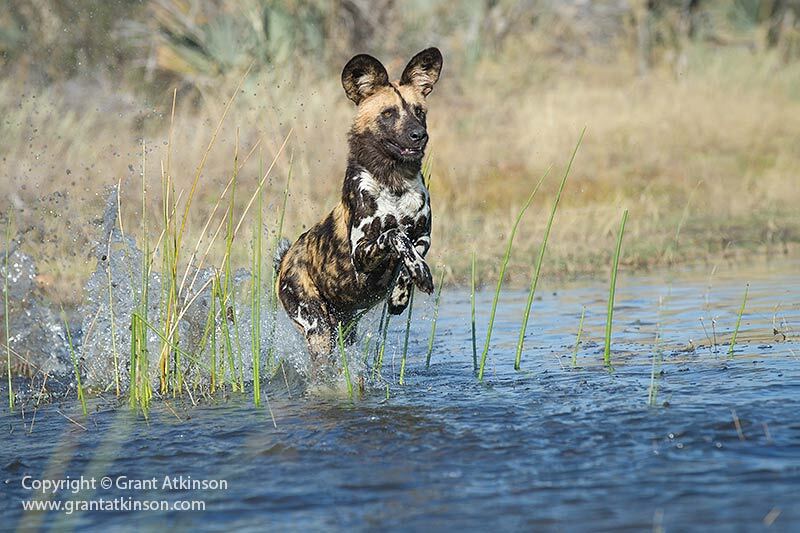 I have seen wild dogs in water many times but never with as much energy as on this occasion. The water was shallow and clear, and the bottom was all white, hard Kalahari sand. The dogs had no fear of crocodiles hiding in it. They raced up and down, spraying water into the air. They also chased one another, with exaggerated bounds, and complete abandon. The height of a game drive vehicle can make it a little difficult to take pictures of wild dogs that show them of well, because they are not that high off the ground. However, the photographs were made more pleasing by the beautiful light and colour. The dogs were running so fast I gave up trying to keep focus on them with the slower of my two cameras at that time, and just used my fastest one. We expected this bout of crazy excitement to end in a minute or two. But it didn’t. A handful of the dogs kept at it, leaping, chasing and showing off their amazing speed. Not once did a dog trip or stumble, even when another was right on it’s tail. We kept trying to find the best position to shoot from, moving our vehicle to avoid patches of tall grass, and with the sun’s angle in mind. We also had to be cautious of getting bogged down ourselves. When the chasing dogs finally trotted clear of the water and went over to where the pups where, we felt almost as tired as if it was us who had been doing the running. That was from the adrenaline rush of what we had seen, along with twenty minutes of intense action photography. Trying to find and then keep one of these dogs in the viewfinder whilst running at speed isn’t easy but they gave us multiple chances. With the sun now a little higher, we fully expected the dogs to gather together and relax. 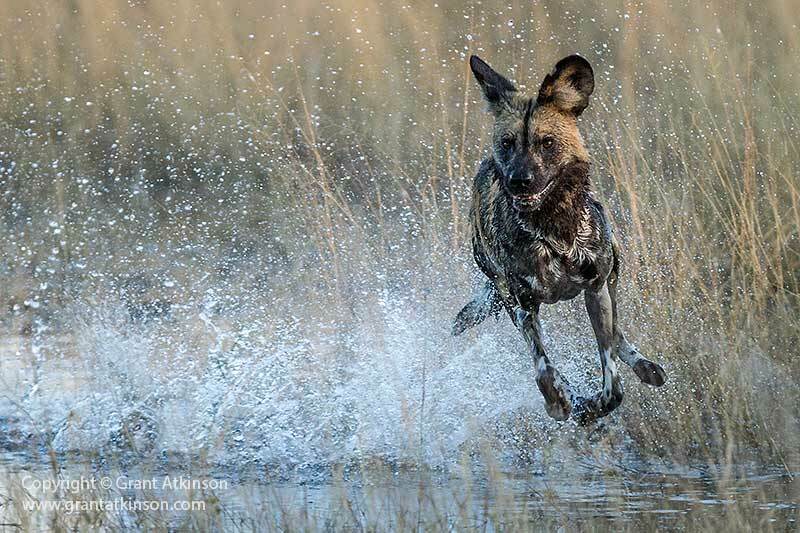 Next thing, the little group of dogs that had seen off the leopards returned, flying at full speed over the channel in order to rejoin the rest of the group. After a happy reunion amongst themselves, some dogs settled, as did the puppies. A restless few though, once again headed off, in single file, at an easy lope. With a pack of this size, a single antelope the size of an impala is not just not enough food. Even though the dogs share what they catch, they need somewhere between 2-4kg of meat a day, Once again we set off behind them. 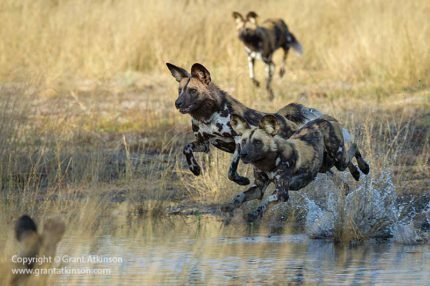 Wild dogs moving through woodland can weave their way around stumps, over holes, and through gaps that a game drive vehicle cannot. We lost them for a few minutes until Finley once again located them by noticing a couple of hooded vultures perched on some palm trees, on a small island some distance away. As we made our way closer to the island we realized that the water around it was too deep for us to attempt crossing. So we just waited. A few minutes later a wild dog popped out of the thick brush on the island, on the water’s edge. Next moment another appeared, then another. Next thing they took to the water, directly in our direction. Once again we were able to enjoy photographing these athletic, energetic animals in action. The dogs had different methods of crossing, some would walk carefully and in a line, whilst others would just crash right on through. Again we shot as much as we could, trying to get accurate focus on the fast-moving animals. By the time they had all crossed over, our arms where aching from holding up our cameras and lenses. We headed back to camp, enjoying the afterglow of experiencing something of the action and interaction that can happen in wild places like the Okavango Delta. I visit northern Botswana each year on scheduled photosafaris like this one. I can feel the excitement you all must have had. 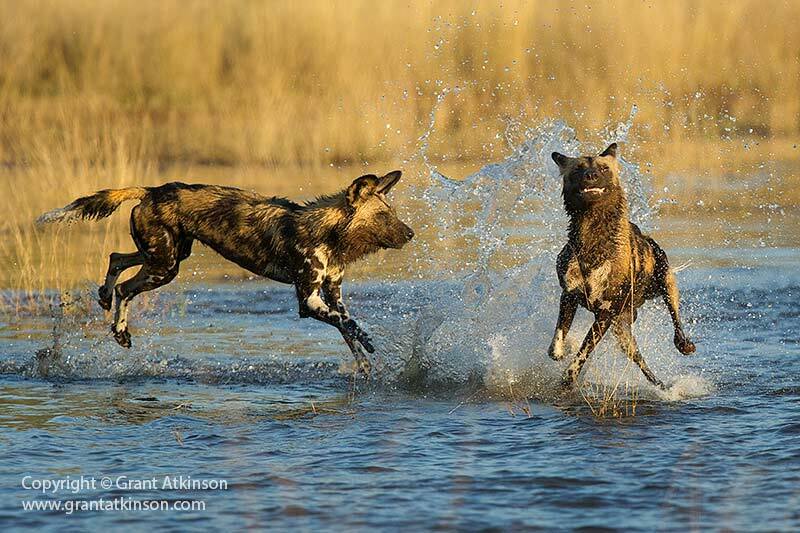 Your wild dog images always manage to catch the action. Makes me want to be back there!!! Great narrative, Grant. I felt the excitement! Something about animals and water often yields a special moment, doesnt’t it? Truly fantastic stuff and I can see why it’s one of your favs. The shots of the dogs are fabulous, I have found photographing dogs to be one of the most challenging. Good for you for getting such great ones. Fantastic Grant! The African wild dogs are so beautiful and fascinating to watch. The colors and action in the water is fantastic. The only thing missing there is me! Thanks for sharing. Fantastic stuff and can see why it’s one of your favs. Shooting wild dogs is one of the most challenging! Good for you!! FANTASTIC images, Grant! I wish we had been with you! We love the dogs and Chitabe is our favorite camp. To see the dogs in the water playing had to be mesmerizing! Wonderful story!! I can see it all in my minds eye. We have seen pieces of this with you including the encounter between the dogs and elephants with a leopard trapped in a tree and a hyena hiding in the grass. We’ve had great encounters with you and Finley at Chitabe. 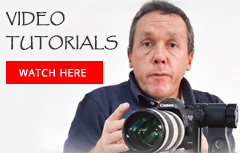 Grant, fabulous images and telling of a great encounter. I have never seen wild dogs, and these images make me so envious. Reading your account of all that action – it emphasises the need to have loads of memory card with you for these special moments. Thanks for reading. The dogs are pretty special, they can be very difficult to photograph well, but they are also exciting animals to hang out with! 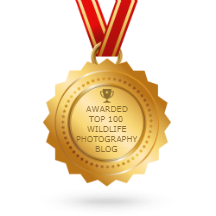 For sure you are right about memory cards…you never know what you may encounter when you are out for wildlife. Hope you get to see some dogs out there sometime!